The Australian Transport Safety Bureau (ATSB) is reminding aircraft maintenance operators of the importance of carrying out functional checks after maintenance. The lesson comes from the case of an Airbus A320 that was involved in an incident in 2018. On 20 September, the aircraft departed Brisbane Airport on a scheduled passenger flight to Sydney with 184 people on board. During the landing roll, the flight crew selected both engines to ‘reverse thrust’ and received an electronic centralised aircraft monitor (ECAM) ‘reverse fault’. The captain called, ‘no reverse’ and the first officer completed the landing with normal braking. There was no damage to the aircraft, and no-one was injured. 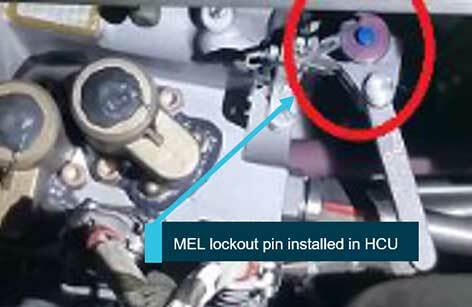 An engineering check found that lockout pins installed in the hydraulic control units (HCU) during maintenance had not been removed before the flight. The result was deactivation of the thrust reverser system. The ATSB investigation found a maintenance team had deviated from procedures, probably due to operational pressure. Before the incident, the aircraft had undergone a three-day maintenance check. Two days in, the engineers identified that the horizontal stabiliser actuator required replacement, which added an extra half day of work to the schedule. To recover the lost time, the team began work at 0400 the following day. Then the aircraft departure time was brought forward, and the engineers were instructed to complete the maintenance by the end of first shift. Many of the engineers worked through their lunch breaks to ensure they could complete the maintenance on time. While working under the compressed schedule, engineers deviated from the written procedures, and incorrect lockout pins were installed and then not removed. The lockout pins should have had a red warning flag attached to make them visible but the one used did not have a warning flag. Time pressure meant that the proper tool had not been used. Also, the engineers did not put additional warning notices in the flight deck for thrust reverser deactivation as they considered the ‘maintenance in progress’ notice satisfied the aircraft maintenance manual requirement. The ATSB report acknowledged that ‘operational pressures are a reality of the aircraft industry, with aircraft delays having a substantial cost impact to operators,’ and that ‘such time and production pressures have the potential to influence safe work practices’. ‘It is imperative in the aircraft maintenance industry that at all levels of an organisation, employees feel empowered to stop a process when they observe procedural violations or foresee that an error is likely to occur,’ the ATSB said. In the early 20th century, Henry Ford sold 17,000 Fords in his first year. He noticed that meat packers in Chicago had an overhead trolley to speed up production and the pace has continued to this day. Empowering employees to call ‘time’ because of operational pressure in the aircraft industry is a good move by the ATSB. When time is money, safety becomes less important and the ATSB has recognised this. Airline departures are a barometer of the time pressures now evident in our society. Stress-related illness is another. The patient person is the odd one out. Perhaps, patience needs to be rewarded? What’s the overlying words repeated here a few times? PRESSURE! Combine that with grubby Airline commercial operators tactics & this is the outcome! They where lucky the reverses have little consequences anyway to perf. Hopefully this event will highlight the obvious corruption that exists out there in commercial aviation but I’d say it will fade away till next time! Airliners think Engineering and Maintenance is a cost for them. they don’t realise the maintenance is the most valuable part of their business and thats what keep the Aircrafts up in the sky. Companies take each and every effort to cut cost from maintenance as well as engineers wages and just not that they increses more and more work load.time pressure with less staff.